Connecticut has so many advantages for businesses: an educated population and some of the country’s best schools, a prime location midway between Manhattan and Boston in the beautiful heart of New England, and a rich history of research and innovation. “A Connecticut Yankee” has for centuries been a byword for a shrewd, clever and successful business person. In spite of her natural advantages and charm, Connecticut has in recent decades become a state riddled with high taxes and regulatory burdens—ingredients for a bleak economic future. State-level policies play a massive role in defining the state’s overall economic health. But Connecticut’s economic policy is not solely defined at the state level. Indeed, Connecticut’s 169 towns are especially adept at meeting the specific needs of local commerce and community. It is at the town level where we see encouraging economic development in Connecticut. Across the state, various towns of varying sizes are embracing free-market principles—often unknowingly—and creating a more hospitable landscape for businesses and entrepreneurs. 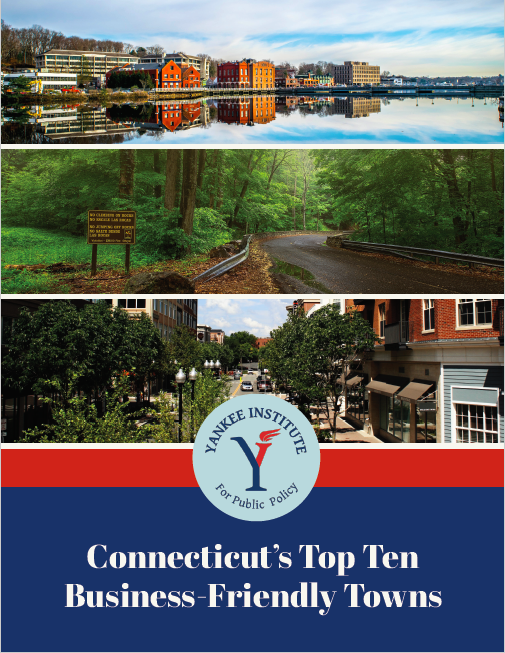 This study examines and measures data collected from Connecticut’s 50 most populous towns. We have ranked the towns based how thoroughly they represent various criteria that ensure business success and protection of the entrepreneurial spirit. The four categories ranked are: Community Allure, Economic Vitality, Tax Burden and Transportation Infrastructure. Our aim is to bring a new statewide focus to the potentially positive power of local decision-making. We applaud the efforts of those Connecticut towns that are creating business-friendly economies.